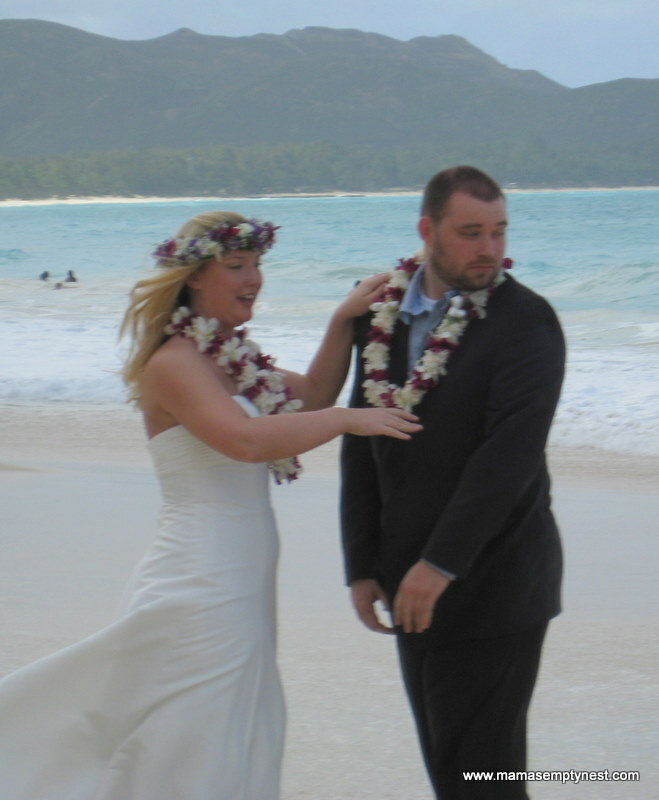 In 2008, our oldest daughter got married in Hawaii. We weren’t able to attend, but we had a Hawaiian themed reception for them when they returned home. 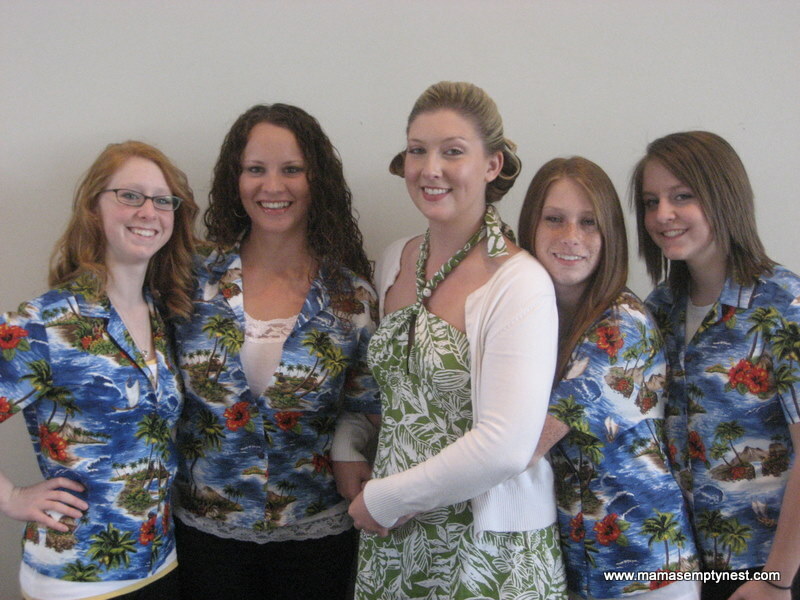 All of us wore authentic Hawaiian shirts to the reception. They have hung in the closet ever since. I have tried selling them, but could not bear to just give them away since they were so darned expensive. We had four of the adult shirts (on the left) and two of the youth shirts (on the right). My sister, my daughter, my niece, and I have each moved into new, old homes within the past year or so and have been trading furniture and re-purposing household items between the four of us. My sister suggested that we re-purpose these shirts by making them into pillows. I thought that was a great idea so I Googled the idea and, sure enough, it had been done before by none other than Martha Stewart (click on her video link here). It is really a super easy project that doesn’t take a lot of time. I’ll go through the steps here along with some tips and hints that I learned by trial and error along the way. 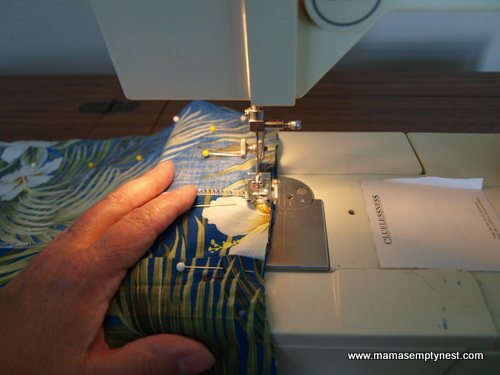 The only special equipment you will need is a sewing machine and the ability to sew a straight line. 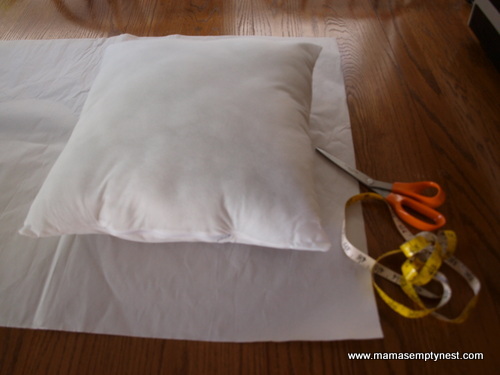 The first thing you will need to do is to determine the size pillow insert to buy. You will need to measure the shirt you are converting to a pillow right at the narrowest part which is across the chest by the armpits. Your pillow insert will need to be 1 or 2″ or so smaller than this to account for your seam and whether or not you want to have a flanged edge, offset the button holes, or do an oblong or other than a square pillow. 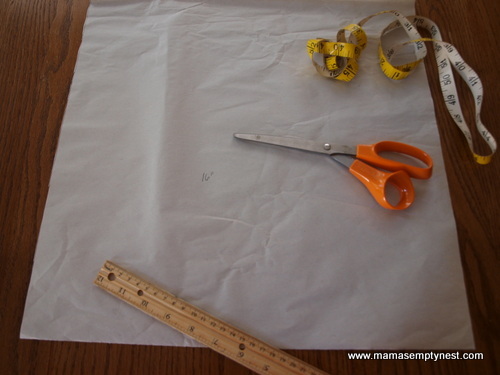 I had some leftover packing paper from moving which I used to make my patterns. I made 14″ and 16″ pillows. 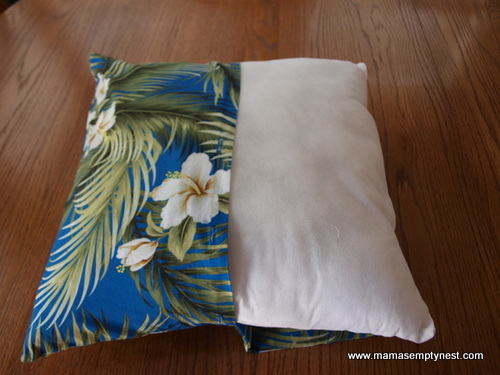 The pattern is about 1″ to 2″ larger than the pillow insert to account for the seam and the “fluffiness” of the pillow. 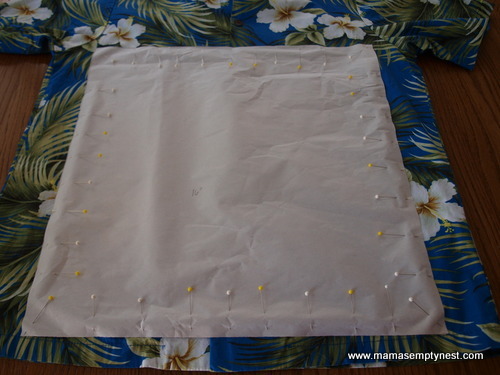 Press the pillow form down onto the paper to ensure that you account for how full the pillow is with your pattern. 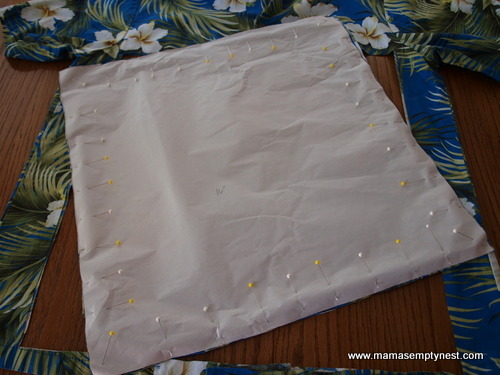 Add ½” to that around all of the sides for the seam. Here is my pattern which I used for several pillows. 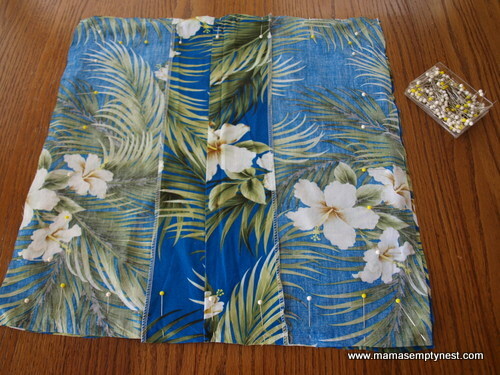 BEFORE pinning the pattern, you will want to iron the shirt making sure that the plackets along the button and button-hole edges is laying flat. Do not skip this step. Pin the pattern to your shirt. Cut out the pillow cover. Martha had a fancy gadget and self sealing pad, but I just used my regular sewing scissors. Remove the pattern. You are not ready to sew the edges yet! You will need to place the right sides together being careful to ensure that you make sure the pattern of the shirt is going the same direction on the front and the back. Time to sew those straight lines leaving about a ½” seam. 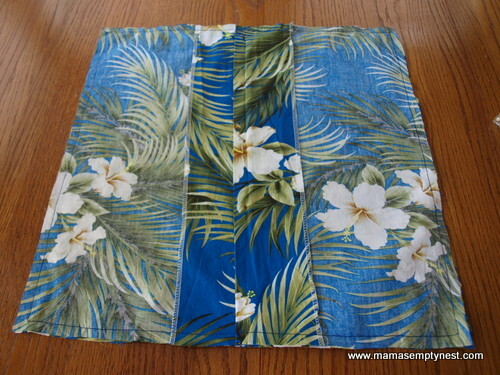 Here is the pillow cover with all four sides sewn together. 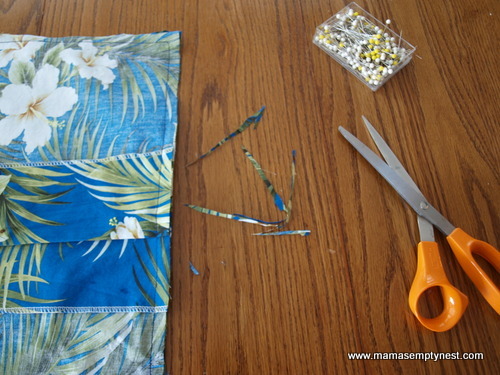 If necessary, trim any extra fabric so the seam edge is all neat and tidy. Turn right side out and iron those edges. You can add a sewn edge close to the edge for a more finished look if you like or sew an even deeper flanged edge, but I liked the basic pillow cover as it was. 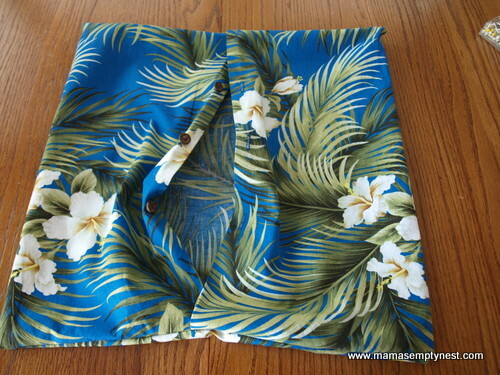 Insert the pillow form and button up the opening. 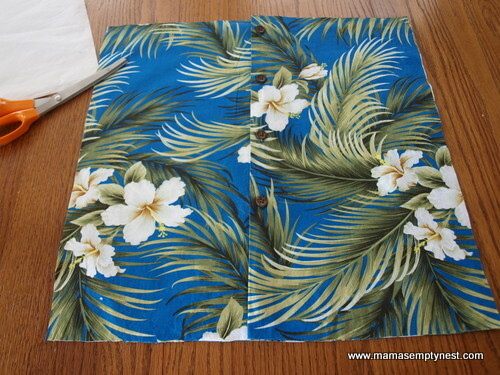 Before and after – shirt is now a shirt pillow! I made five of these, and it only took part of an afternoon. I had an extra insert and an old canvas tote bag and made one more pillow. My sister plans on putting these on her porch swing on her newly finished screened-in porch. 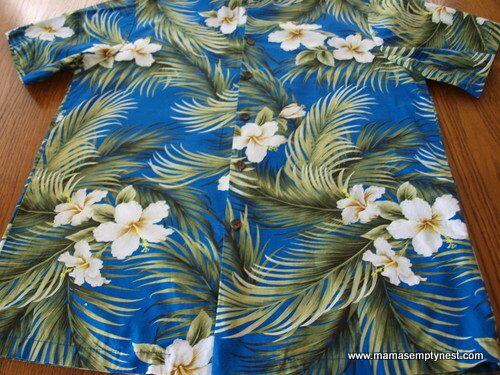 It will add nice color and the Hawaiian fabric will always remind us of my daughter’s wedding. Wouldn’t this be a wonderful way to remember someone? 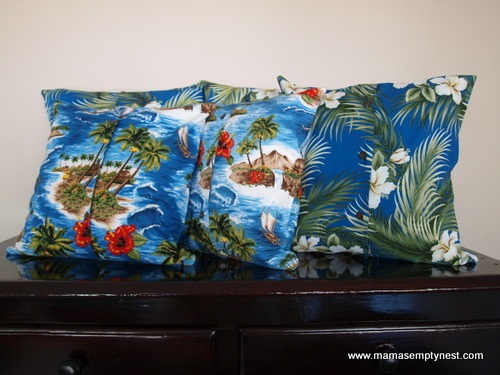 Make a shirt pillow out of a deceased loved one’s favorite shirt – what a nice way to remember them. 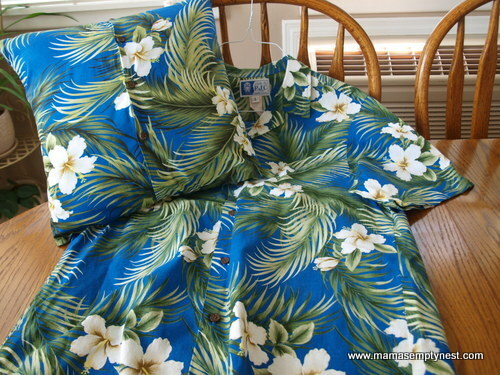 Make a shirt pillow out of flannel shirts, denim shirts, or other soft fabric. How nice for a vacation home or a special space. You could make small, oblong pillows out of your baby’s outgrown footed pajamas to create a sweet memory and a small pillow for a toddler for their first “real” bed or for traveling. This has been a DIY, re-purposing summer for us, and I hope to share more of what I have been making soon! This entry was posted in Food & Home and tagged DIY. Bookmark the permalink. Thanks for sharing!! That is so neat!! I love being the beneficiary of my sister’s talents and can’t wait until my sun room is finished and I can put these in their place. Thanks, mama! Love, love, love this idea! 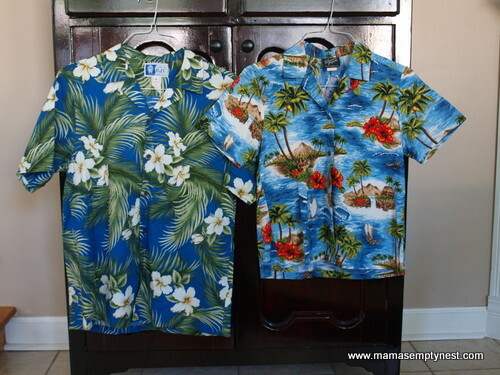 Especially for a sunroom + the shirts didn’t go to waste. We loved the idea, too! My sister thought of it and I guess I shouldn’t have been surprised that others had already thought about it! I think ithis is a great idea. 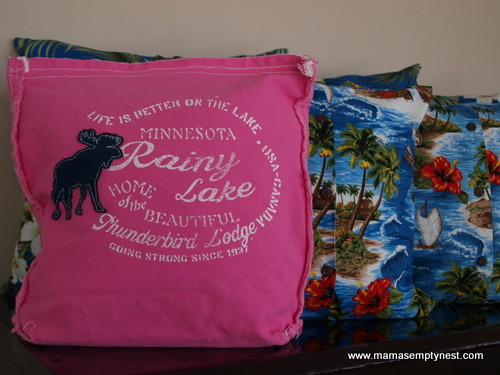 Love the pillows..especially the “Rainy Lake” one. It was a fun project. I’m working on recovering some outdoor cushions for a metal table and chair set that my sister bought. She will be using it in a 4-season room so we are using denim. Can’t wait to share her new room with everyone – lots of great colors and a fun new space.